Summer is almost up! It’s halfway through August and I feel like school ended last week. Asking myself what I did this summer is pretty much fruitless because the Hell if I remember. Time is slipping past me like sweet drinks disappearing at a summer party. It was like basking in a fountain of undisciplined youth, where my spirit ignores any form of calendar, finding balance in a sort of timeless hedonistic blur. But something now in the back of my mind is telling me that it is ending… probably all of those school related e-mails. For those of you out there who may have also just realized that summer is indeed ending, I have today a band for you which will hopefully allow you to make peace with that fact. 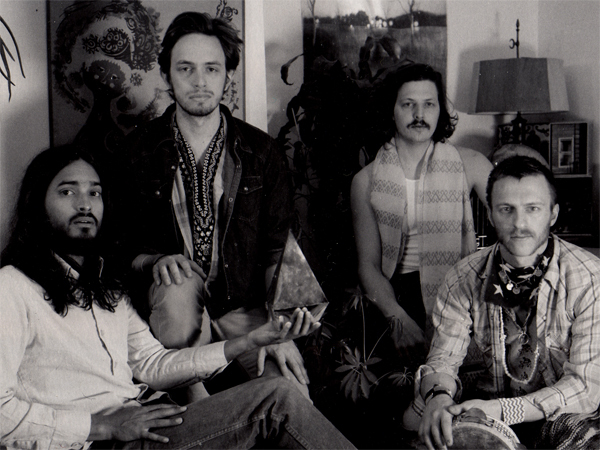 Yeasayer is a Brooklyn based band which fuses psychedelic indie folk with something which could only be described as gospel soul. Put away your doubts until you hear this reverent amalgamation. Their debut 2007 album, All Hour Cymbals, is something unlike anything the world has heard prior. I’ll provide you with a few of my favorite songs from it. The second song on the album is ironically named Wait for the Summer. With a brief spacey intro this song does not hold back from heading straight into the melody. “Life was easier when one of us was dead.” The lyrics of this song and the entire album are gorgeous, bursting on multiple cryptic layers with hidden messages that could be either taken as quasi-religious or blissfully hedonistic. The vocal sound itself is also extremely unique, with ample amounts of chorus and humming noises hidden giving it that gospel vibe. The mixture of the sleigh bells and the sitar-sounding guitar create a bizarre mixture of musical styles from different regions of the world and the spacey synth acts as a multi-cultural glue. The entire first half of the song is in your face waving its brazen weirdness. However, right before 2 minutes, the song goes through an absolutely wonderful metamorphosis. The latter half of this song contains the kind of vibe that if it had existed during the 60’s, would force hippies into rhythmic swaying and all around mystic magical merriment, and or deep introspection. Not that hipsters aren’t actually the odorless modern day incarnation of hippies and aren’t doing this in Brooklyn apartments. The vibe that the ending of the song puts out is that could be in some old foreign cartoon. “I’m rising, rising, falling down” is the sort of chant that could easily garner a following and start some sort of revolution. Simply put, this next song 2080 is a masterpiece. And if the previous song already had you swaying and feeling enlightened then prepare to be blown away. The introduction seems to slow time as a swarm of insects is locked into battle with the glorious tone of the guitar. The bassline and the drums create one of those rythms that an enlightened individual would argue as being perfect. The lyrics in this song can only be described as prophetic. The multiple meanings are so broad that even the title of the song can be included. Every time I hear 2080 being said, I can’t help to think that it may also mean 20 A.D. as if they were analogous in some way. Halfway through once more, the song becomes an epic chant. This one is the kind that melts away any anxiety and fear and replaces it with forlorn anticipation and respect. Words cannot describe the magic this song instills effectively multiplying any spells you have already cast upon yourself. The ending with the children chanting is simply cool, an appropriate ending to a song describing the glory of future generations. Time has nothing on it. This last song I decided to include is a personal favorite and actually one of the more unique songs on the album. Wait for the Wintertime I would also assume is the direct opposite of Wait for the Summertime. The song starts you off as if lost somewhere in a frozen winter wasteland. A fiendish howl and a beat drops in which for some reason makes you question if the frozen plains are not actually some middle-eastern desert. “Solid gold, and nothing is gonna stop us” solidifies that vibe as the song takes you on a roller coaster ride which has you questioning materialism and all of Brooklyn culture. While the first two songs made you feel holy, this one gives off an almost cultist vibe. The slow beat feels like it’s pulling you into hell, with demons laughing and bouts of guilt flooding you along the way. The way the song transitions between sections is eerie in the sense that it feels like it is delaying the inevitable. Brilliantly evil in my opinion. The rest of the album isn’t as evil by any means, but I like to play this song once in a while to confuse people. As you now listen to this band, remember that time may actually not exist according to the discovery channel. That does not however say that summer doesn’t end, and if that fact upsets you, then just don’t forget to Wait for the Summer. Unless of course you are one of those people who prefers to Wait for the Wintertime. P.S. I started writing this article on Sunday. I don’t what happened, but now it’s Tuesday. Time is weird man.